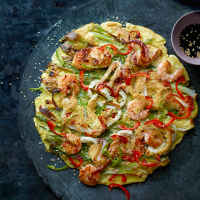 This dense, savoury pancake (say: hemool pa-jon) is a popular snack across Korea. It makes a fantastic starter or sharing dish for everyone to dive into with chopsticks, mopping up the dipping sauce along the way. You can use whatever selection of seafood you like, or a plain salad onion version is also good. 1. In a small bowl, combine all the dipping sauce ingredients; set aside. 3. For the batter, mix the flours with the salt, then add ½ the beaten egg and the remaining garlic. Slowly whisk in 150ml ice-cold water – don’t add it all at once, as you may not need the full amount; the batter should be the consistency of thick pouring cream. 4. Set a 22cm non-stick frying pan over a medium heat, add the sunflower oil and, when hot, ladle in 2 / 3 of the batter. Use the back of a spoon to coat the base of the pan with it. Place the salad onion strips on top, with the green ends lying in both directions, then scatter over the seafood mix and chillies. Add the remaining egg to the remaining batter; whisk to combine, then drizzle it over, so that the toppings do not come loose when flipping the pancake. 5. Fry over a medium heat for 3-4 minutes, until the bottom is set, then invert the pancake onto a plate and slide it back into the pan; fry for a further 3-4 minutes, until the seafood is cooked through and the pancake is golden and crispy. Cut into bite-sized pieces and serve with the dipping sauce.